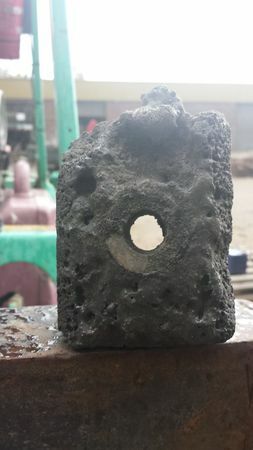 Good luck Koen , maybe you have a different type of fire brick to the one i used , my brick was very lightweight and came out of a electric kiln oven , i used the brick to support a 25mm x25mm round piece of tungsten with a 10mm hole and the tungsten stood up very very well to the heat ,but i could see around the edges that the brick was turning to glass and so moved onto something else at the time , i will see if i can find the test piece and take more photo’s to show you . Wow the tungsten must of been costy. Motivated and inspired by how customers strive for their full potential, The Siam Refractory Industry Co., Ltd., in SCG CEMENT, dedicates itself to quality refractory products and services. Koen, This looks like the firebrick I use. They can become glazed with melted ash, but the bricks hold up well. 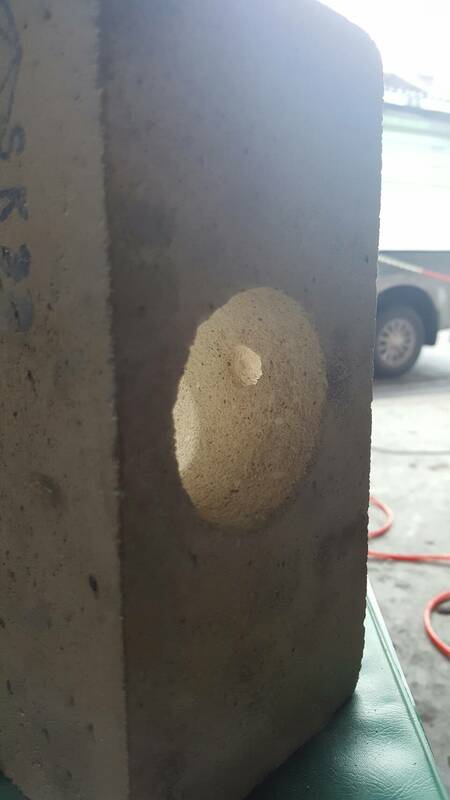 The small hole entering the larger hole is interesting. Is that the orientation you will test? 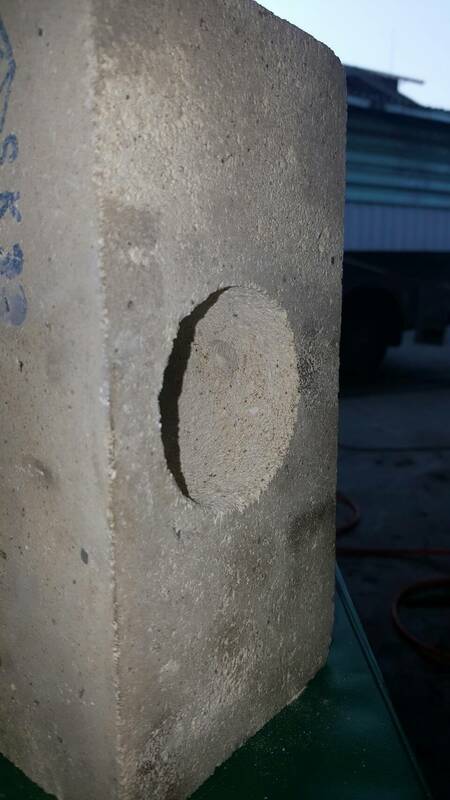 No, the hole was just a test to see some strength. 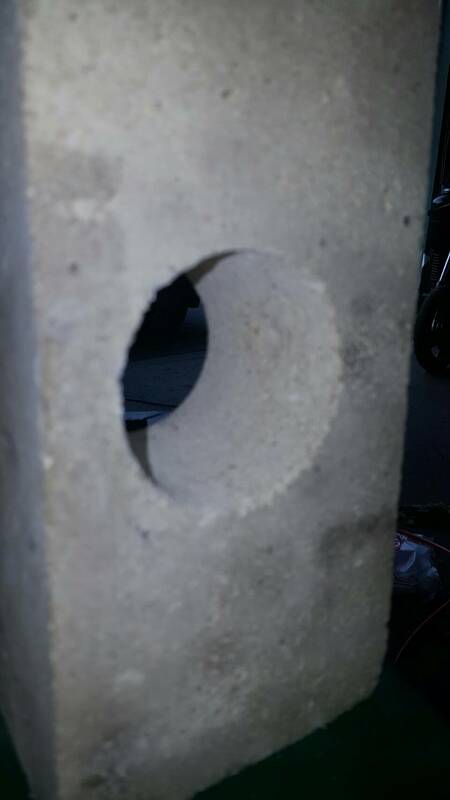 The big hole was with a quality hole saw, not diamond, not wet. I will look into a kind of drawer that holds the nozzle, the direction of the hole(s) can be choosen freely at will. I am not aiming for an ever lasting nozzle, i am more old fashion, clean out every day and keep all in good condition at all times. I clean my rifle after every session, my saw is sharpened, shovel is oiled, tanks filled up, why should i not take care my gasifier ? 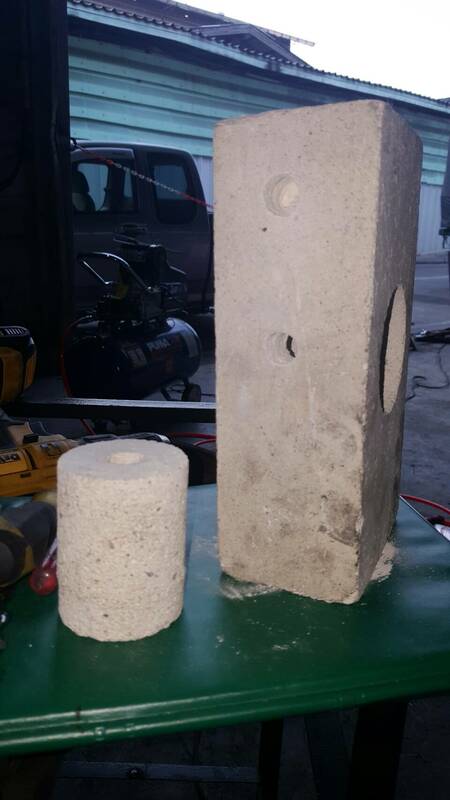 Koen, that looks like the same type of fire brick I’m using in my charcoal gasifier. It is heavy and dense. The Tungsten piece i got was pretty cheap , my brother begged it from out of a customers scrap bin for me , i wish i could lay my hands on it at the moment but it must be filed away under the try again sometime shelf , here are a couple of photo’s that i took after a couple of runs with it in place , you can see no marking at all on the tungsten piece its self just melting on the fire brick . Koen, Thanks for getting this discussion back on track. Nozzles are fun to play with and we need a good place to place our collective experiances. Tungsten should be the cat’s mewow! I devlved a little deeper into Bruce’s copper nozzle which is a probably a little cheaper than tungsten. This piece of copper is 1.5 inches in diameter with a .75 inch hole. It weighs about 6 pounds and cost about $130. I tried it last fall on my simple fire style nozzle. This means about half of the nozzle was inside the barrel exposed to high temps while the other half was on the outside of the gasifier. In the low light of dusk, I could see the copper pipe glowing a very dull red which covered it with a layer of black copper oxide. This past weekend I got around to placing a water jacket around the outside of the nozzle and gave it a test run. I shot a video and will get it put up as soon as I can get it edited. For now, here are some shots of the set up. My gut feeling is this system will work. My big delima for now is what to call this style nozzle. I like to respect those whose work inspired ideas so should I call this style the “Big Bruce”? I did a little digging, and unsurprisingly it seems tungsten tube is not an easily sourced material. 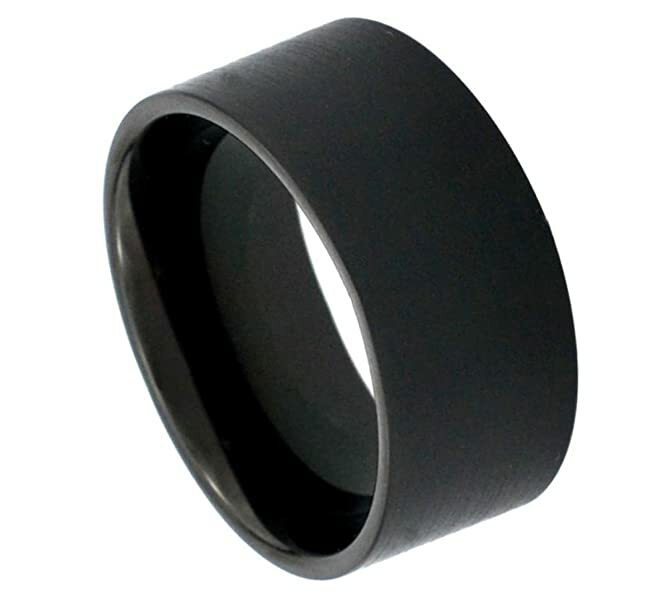 However, it got me thinking, what about a cheap tungsten carbide wedding band? granted, you are only going to get maybe 12mm of “nozzle”, but they are available for 10 bucks. 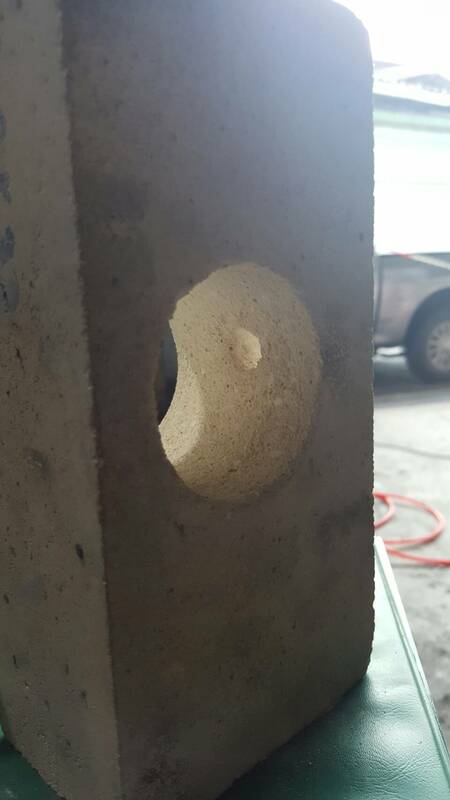 you first drill a slightly larger hole in a firebrick that will fit the nozzle, chisel out the material, then drill out the center with the size you want your nozzle to have. the ring rests on the lip, and maybe you cement it in there with some furnace cement. The whole job only costs 13 bucks, and you get yourself a nozzle tip that should handle 2800 degrees centigrade. 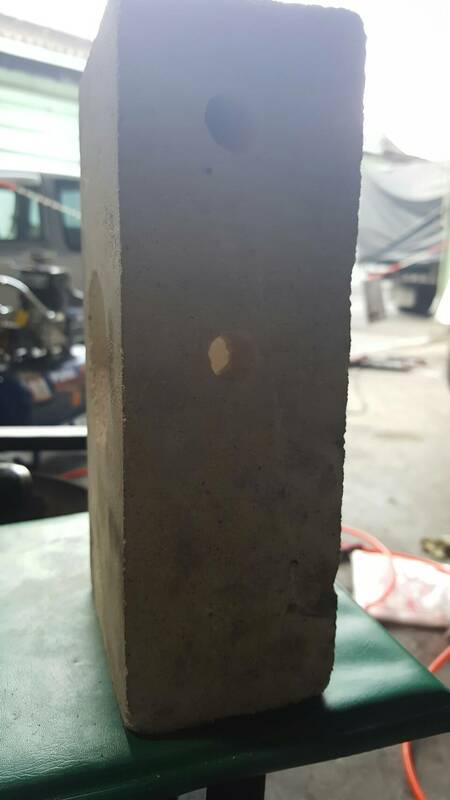 The brick I would think would wear out first, and it can be replaced for a couple bucks. You are limited a little bit by the available sizes of wedding rings and hole saws, but if you look at the sizing chart, it looks like you can get between 17 and 24mm just with that particular ring. Any thoughts on that nozzle idea? 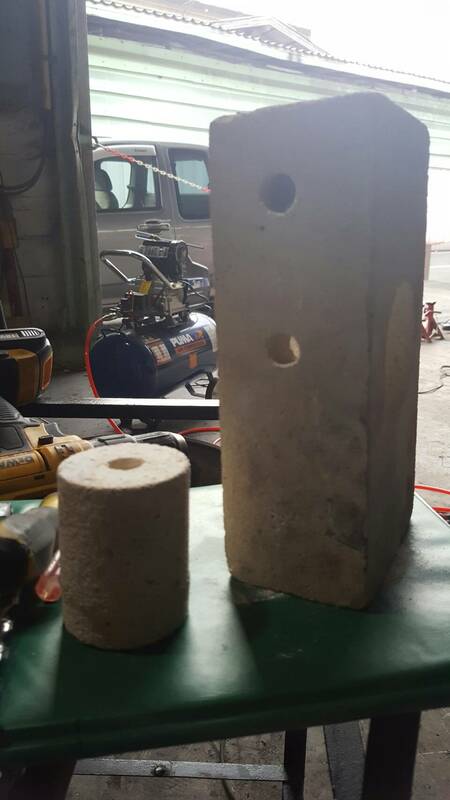 Dave, that must be some soft fire brick. I’ve never seen any burn up like that. Gary, that copper nozzle and water can sure looks good. I don’t know how they can charge so much for $20 worth of copper? Kristijan, It will be interesting to see how the ring performs. I don’t know what to name Gary’s copper tuyere, but we can call yours the Nupital Nozzle. Garry, your idea is wery interasting. Basicly you have made a water cooled nozzle with conciderably less conplication that say a double wall nozzle. You can now use the stean to temper your gasifier too! Maybe now a vapor return towards the inlet ? The benefit would be that it lowers the temperature in the hot zone / reduces the nozzle temperature, reduces the steam forming/ selfbalancing with the steam ? It worked with my setup from the 3 wheel bike, it might be working for your setup to ? 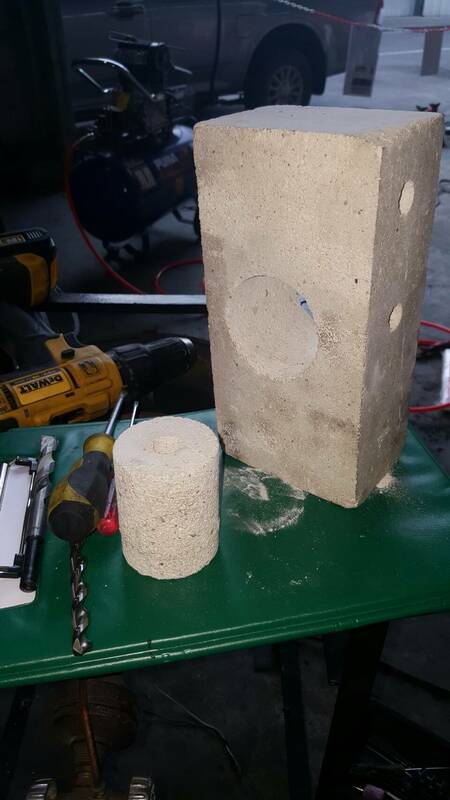 That idea might be worth trying, however i doubt the need if using a firebrick anyhow. The tungsten can withstand the highest temperatures yes, but anything above ash deforming temperature will lead to slack and clinker anyway. in WW2 there were different approaches about nozzles for charcoal gasifiers. Heat conduction to the outside of the gasifier. A large cross sectional area of the nozzle is required. Can be steel or copper. Cooling fins or something similar outside are required. Gary Gilmore’s copper nozzle from posting 9 is a good example. Heat exchange to the incoming air stream. You need a large surface in the air channel. So in this nozzle, there was no central hole but several small holes for the incoming air. Not sure why this is in my brain, but it is. After seeing so many melted nozzles and different solutions, this came to me. I’m not sure if it’s a good idea so constructive criticism is welcome. I’m thinking of a wear item above the air inlets. Stainless steel? A solid rod or tube? The air will enter in a tube with two rows of holes at a slight angle outward. My thoughts are the incoming air would brush the outside of the wear rod above it. The wear rod would also prevent charcoal from plugging the air holes. A grate would be under the air inlet pipe and allow for removal. Hi Bill, the rod or pipe would warp if it was not built heavy duty. But how about the pipe above it, is filled with water and had a flow of water continuously flowing through it. Nice water heater when in use. The pipe would have to be heavy walled pipe. My cross flow has this kind of heavy plate over the nozzle area. Still need to put some hours on it to see what will happen with it. It’s propose is to keep the hot white char from touching my nozzles. It has been working so far. I like the idea, the principle is essentially what Bob is doing. The people who know their charcoal systems could comment. The main thing I wonder with such an approach is, isn’t the concentrated air jet blowing into the charcoal a desired feature? I thought the intense combustion lobe had desirable effects? If that is the case, then a shield would best be designed to refocus air flow, then essentially it’s a sacrificial / heavy built cap? well, I wouldn’t recommend that design. This heavy rod suffers a lot from the massive heat and oxidation, it will warp like Bob said and it is oxidised with time. And as Garry said, you better have a concentrated reaction zone. 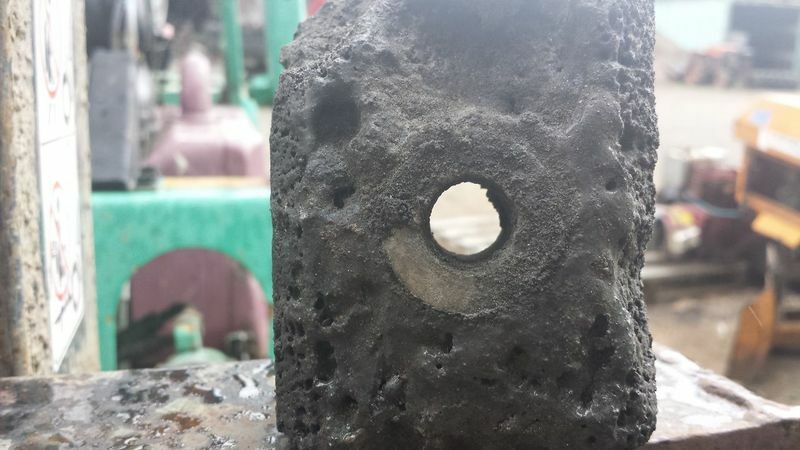 If you would like to go with this pipe nozzle with many holes like Kristijan does, use a thick walled massive nozzle pipe and according to his experience you are fine. Otherwise I would recommend a forge type nozzle like Don Mannes built for his Geo Tracker or Gary Gilmore for his ranger. Hi Gary! That is a huge hunk of copper. I like your idea of going thru that cap on the inside. I didn’t see how you sealed the outside from the water and assume it is a rubber hose with SS hose clamp. I found a hunk of Titanium hose fitting which measures 7/8 of an inch high x input bore 17/32 x output bore 22/32 of an inch with 3/32 thickness at the output end and then very thick 1/16 inch thickness. That should be about 3/4 of an inch output bore. 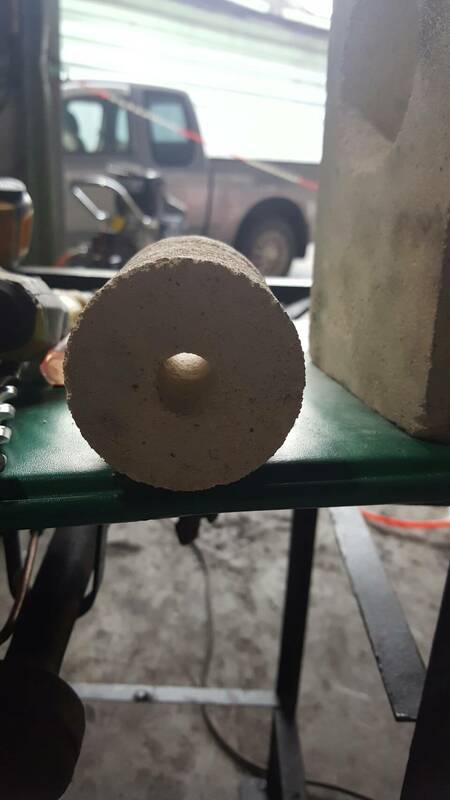 I think I will find a good clay firebrick and bore and insert that in there with a copper tube going into that somehow as the nozzle for a side insert into the reactor similar to your tube ( copper pipe ). Sort of like Carl used too. I am thinking about wrapping that copper pipe on the outside with copper tubing and run some water thru it for cooling and if it steams shoot some thru the pipe after it gets reacting. Seems like a good starting point.